I got a nice surprise in the mail this week from MarketLeverage. 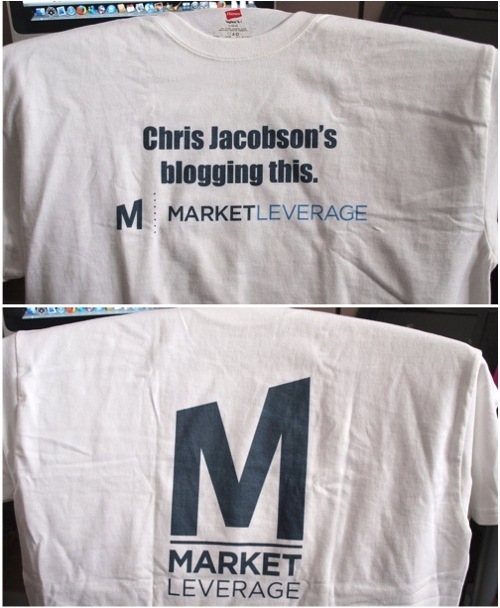 They sent me my own “Chris Jacobson’s Blogging This” t-shirt! This is part of their “I’m Blogging This” t-shirt line, which has been very popular ever since it came out. I think they also learned to send items to me via regular U.S. postal mail now instead of FedEx, as I got the package in 7 days and not in 3 weeks. While this shirt is uniquely designed for me, the concept itself is also spreading among the affiliate community. Last month, John Chow showed off his shirt, as well as Enkay. Thanks ML, especially Dina! You guys are awesome.